Formerly used as a granary and milling house, Great Bodieve Barn has been skillfully converted to provide four spacious self catering holiday cottages, with an emphasis on quality furnishings and modern fittings, whilst retaining much of the atmosphere of the original building. 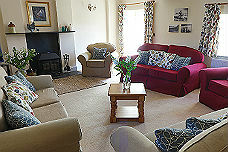 Central heating throughout ensures all year comfort. Free WiFi is available in all the cottages. Great Bodieve Farm Barns are close to some of the best beaches in Cornwall including the large sandy beaches at Polzeath, Daymer and Harlyn Bay. Renowned for their excellent surfing, these beaches are also popular with families. There are fantastic walks right from the beach on to the coast path which meanders along the dramatic cliffs, beaches and hidden coves of North Cornwall. Wadebridge, through which the Camel Trail runs, is just a mile from Great Bodieve Farm. The Camel Trail is a renowned cycle and walking trail which runs from Padstow along the Camel Estuary through the pretty town of Wadebridge and on to Bodmin and Bodmin moor. Bikes can be hired locally and, for those who bring their own bikes, bike storage is available at Great Bodieve. There is a host of leisure opportunities in the local area, ranging from boat trips along the coast, sea fishing, trout and coarse fishing, golf, horseriding, waterskiing, surfing, sea kayaking, coasteering - the list goes on! Great Bodieve Farm is close to many of the film locations of the recent Poldark TV series. Bodmin Moor featured heavily in the Poldark TV series and, for some of the cliff scenes, the filming action took place in the Padstow area with spectacular shots across the Camel Estuary and Tregirls beach. You may also recognise scenes from the sandy beach of Porthcothan. 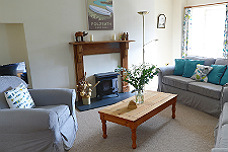 Our one bedroom cottage, The Goose House, is the perfect romantic getaway, while The Mill House, which sleeps 8, with a king size en-suite bedroom on the ground floor level, is ideal for the extended family holiday. Well behaved dogs with responsible owners are welcome. Daymer beach, just 10 minutes by car, is a great dog friendly beach with scenic walks along the stunning coastline to Polzeath. 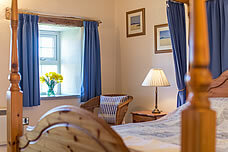 Cornwall is beautiful all year round and a warm welcome awaits guests at Great Bodieve Farm Barns. 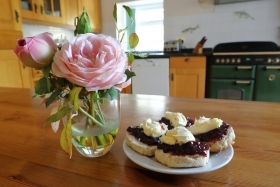 A delicious cream tea greets guests on arrival. Out of season short breaks are often available. 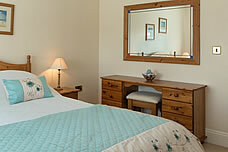 Short breaks may consist of up to 5 nights duration at 70% of the weekly tariff. Please enquire for more information.